Fangs For The Fantasy: The Walking Dead Cliffhanger - who will die? So Eugene is probably prominent enough to be shocking. He has been in the show a while and has something of a prominent story. We have seen his evolution from coward and liar, to him stepping being useful, being brave, learning and being willing to fight while still preserving his intelligence as his primary asset. Eugene is almost important enough to kill in this shocking manner. However, we’re not convinced. We think Abraham has a lot more story in him before he dies (before he becomes too prominent and threatens the Rickocracy as an alpha cishet white man) and it seems dubious to have changed the story so dramatically to save him a few episodes ago only to take it back now. Oh don’t you dare! Don’t you even dare touch Michonne! Michonne is such a fan favourite and a character that is finally getting some much belated representation and fandom is positively squealing over Richonne. Part of me thinks this is so dangerous for her. The potential for her to be killed off for a big whack of Rick Manpain is high. And there are few characters who would be as shocking to kill as Michonne. I want to hope she has enough plot armour to survive this - but she’s not Rick, she’s not Carl and can provide maximum Manpain for both. She’s on very thin ice. She’s still not favourite to die, there’s so much more she can do and, honestly, the lady with a katana is just too awesome to put to bed and I doubt Walking Dead is going to throw that away… but safe? We can’t say she’s safe. In terms of pure shock value I think Daryl would definitely be favourite - and this scene is all about the shock value. Daryl is also an original character from the first season like Glenn. Other than Abraham and Rick, Daryl is the character Negan is most likely to see as a threat making him a reasonable target. From a storytelling point of view, he’s also someone you can dispose of without disrupting the group. His potential romance with Carol has been derailed and he isn’t even all that close to anyone else in the group. Aaron has played his sidekick once or twice, but since Aaron is little more than an extra who has done nothing and barely appeared for several episodes, we can hardly expect that to hold him. He has few storylines of his own - he’s evolved and grown but where does he go from here? We’ve touched on his abusive past, his brother and his hold is gone, he has no budding relationship or growth or even family and we’ve already looked at how he doesn’t really fit into a secure settlement. In fact the death of Daryl, the ranger, the wilderness man could be symbolic of their transition from wandering survivors to settled civilisation builders. Daryl is perhaps THE fan favourite. That could save him - or could make his death the shock that the writers are really looking for. While Sparky’s favourite is Maggie. See all that we wrote up there for how Glenn would be the perfect choice? It all applies to Maggie as well. The hope. The relationship we were all rooting for. The baby to come - only with extra pathos and crushing of that hope by killing the pregnant mother as well (something Walking Dead is willing to go for - see the death of Lori). We have the most epic of epic manpains for Glenn with the loss Maggie. We have the death of a very well established main character for shock value - to say nothing of her being a pregnant woman. 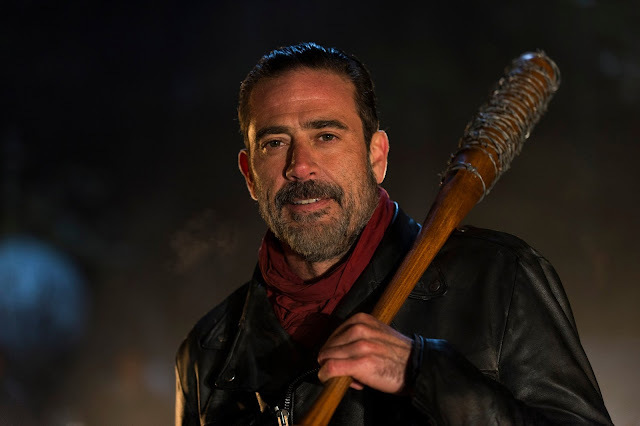 To Negan, killing a pregnant woman is also the ultimate symbol of Rick being unable to save his own people.